This is not something you see every day. 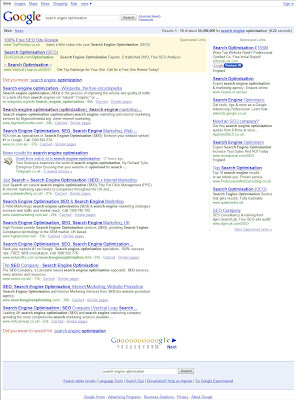 We're looking at a Google News insert to a Telegraph article about search engine optimisation. Yeah; we could be looking at the annoying was Aussie sites flood UK SERPS or that Google suggests I spell optimisation as optimization. Meh. Kudos to Distilled and Will Critchlow for making the article. It helps the industry as a whole. Seeing this more and more, the big one for me is Google local business results, they really have an impact on what you see above the fold. Is this done so more advertisers have to use PPC to get traffic? It seems this has changed already - as I am getting a number of YouTube Video results returned alongside the mainstream results - and no reference to Wills earlier Telegraph article. Just found it, I only get it when I have 100 results showing though, otherwise it's business as usual for that term. It's always interesting to see the mainstream media take an interest in our profession. I loved Charlie Brooker's article while back - http://www.guardian.co.uk/commentisfree/2008/jul/21/charliebrooker.pressandpublishing.